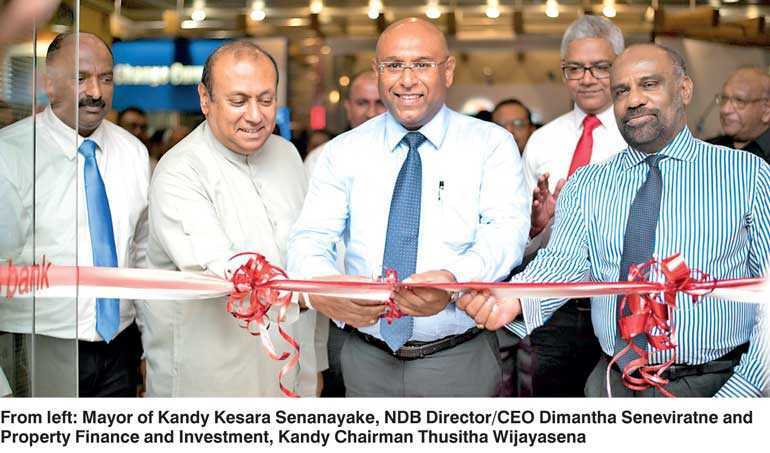 A new Privilege Banking Centre was ceremoniously opened at the newly renovated NDB Kandy City Centre Branch by NDB CEO Dimantha Seneviratne followed by customer cocktails at the Golden Crown Hotel, Kandy. Privilege Banking is NDB’s symbol of commitment towards delivering complete financial solutions through exclusive Relationship Management across the customer’s entire wealth portfolio. With the opening of this new Centre, NDB hopes to create further means in which to address the customer’s needs. NDB’s goal is to deliver the best suited financial solutions and excellence in customer service backed by superior technology and innovation. Thus, the Privilege Banking Unit covers all Banking Products and Services and extending to Government and Corporate Securities, Foreign and Local Currency Deposits, Cash Management and Customised Transactions to suit the customer’s individual profile. Services in the form of banking products, stockbrokers, Investments, Asset Management, Custody Services and Legal Assistance can be accessed by the customers across all NBD branch centres. NDB Privilege Customers will receive identification across all branches and the Privilege Centres are available for their needs including meeting rooms even when the customer is out of town. Additionally, the customer will also receive special infinite credit card facilities with a number of offers. The bank has also implemented a new PRV Relationship Management based model across the Network. NDB Privilege Banking Relationship Managers are specifically trained to cater to the customer’s unique needs through Privilege Banking. Each relationship manager can be reached at any time to handle the customer’s requirements. Privilege Banking is designed in such a way that if the customer’s appointed relationship manager is unavailable, a back-up relationship manager will be available to fulfil the customer’s needs. With the ability to access all group company services, the designated relationship manager has the capability to coordinate with ease and provide the best of financials solutions to meet the customer’s requirements. In addition to the PRV Centre, NDB also launched a self-banking unit for the convenience of the customers. The self-banking unit allows clients to bank with ease, accepting cash deposits, cheque deposits and withdrawals.